When it comes to money, everyone knows it, uses it and does not pay much importance to it. There are so many things that are really interesting about the history of money as a whole and this is what this infographic is showing you. 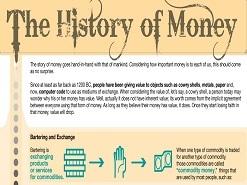 The History Of Money infographic features so much really interesting information that actually starts from 1200 BC, when people were mainly interested in the value of objects. Since then we had shells, metals, paper and computer codes having value and being used as exchange mediums. In the beginning trading was all about bartering. Cowry shells were the very first currencies used, discovered in China. Metals took over in around 1000 BC, making coins so much older than what many imagine. Did you know that the very first coins used in trading appeared around the year 600 BC? This is exactly the type of information that is presented in the infographic you see below. Money is seen by many as being dangerous but it did offer a solution to various problems that appeared for people all around the world, ever since the beginning of time. Some things were seen as being more valuable by all humans so having a value led to bartering more for them. Then, money appeared and transactions were much easier. It took thousands of years till paper money first appeared. Around the year 1000 it was when the first paper bill was used, again in China. Europe banking then revolutionized everything and gold eventually started to influence money value. All this eventually led to Google Wallet and similar systems being implemented all around the world. Specialists believe that Bitcoin and similar ecurrencies are going to be the currency of the future. Whether or not this is correct remains to be seen but still, we need to know more about the history of money, each and every one of us. Take a look at the infographic to learn about the most important moments in the history of money and other facts of interest that you are surely not aware of.